B) the radio frequency types where the data transmission is made by radio frequency! Both systems have advantages and disadvantages. 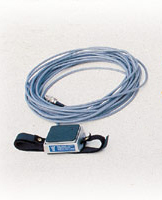 The less expensive cable type transducers (VLT 1032 - VLT 1043 and VLT 1063) are fitted directly on the tapping points of the air brake or hydraulic system and from there the cable goes to the connection box. 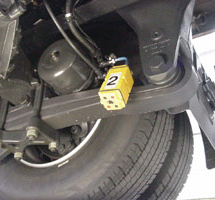 A disadvantage is that the vehicle is limited in movement and it takes little more time to install. The radio frequency model is much faster to install, no cables on the floor. VLT’s new range of Radio Frequency Transmitters is extremely fast, close to real time transmission of the data to the VLT Roller Brake Tester controller. The time-saving by using the radio frequency model compensates the higher investment most of the time. We can offer very basic systems with only two, three, four, etc. Air Pressure Transducers, up to three sets of up to six (6) Air Pressure Transducers in one Vehicle Test Lane. This is very efficient at Vehicle Test Lanes with high throughput. We can supply you special sets for time measurement of rise and fall time of air pressure in air brake systems of tractor - trailer combinations and other vehicles.